Dr. Jörn Günther Rare Books is delighted to announce their attendance at TEFAF New York’s debut fair 21st-26th October 2016. There will be a selection of important illuminated manuscripts and early printed books that have been carefully guarded throughout the centuries and are rare offerings to the international market. Dr. Jörn Günther Rare Books has enjoyed more than twenty successful years with the fair in Europe and greatly looks forward to expanding with TEFAF into New York. To mark the event the gallery will highlight themes of exploration, voyage mapping, and the medieval discovery of new lands. A notable example is the Compendium (Castile, c. 1425), a unique and completely unknown manuscript containing a combination of educational texts made for the young King of Castile and Leon, Juan II (1405-1454). There are seven full-page illuminated leaves included in the manuscript, most notably a thought-provoking map, the image of which is dominated by a deep- set, inky blue, indicating the surrounding ocean and the world yet to be explored. A physical relic from the very heart of the Age of Discovery, this manuscript is likely to have been seen and handled by some of the most central figures of the age, like Juan II’s daughter, Isabella, who, with her husband Ferdinand, succeeded Juan on the Spanish throne and launched Columbus’ famous expedition across the Atlantic. 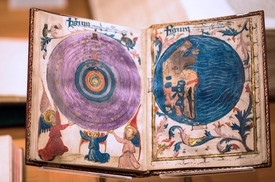 This codex is the only example of its kind and within a generation of its production, the image of the world it depicts was altered almost beyond recognition. It is poised, as it were, on a precipice between the medieval and modern worlds. A poignant counterpart to the Compendium is the historic edition of Christopher Columbus’ letter to Isabella and Ferdinand recounting his discovery of the Americas (Basel, 1494). The text is illustrated with six remarkable printed woodcuts that show a stylized view of the Bahamas, the Caribbean Islands, and their inhabitants. This may be a once in a lifetime chance to acquire such a monument to American history. Significantly, Dr. Jörn Günther Rare Books will also feature the first ‘modern’ atlas. Along with Classical Ptolemaic maps, the atlas includes large parts of the American Atlantic coast and the West Indian Islands, which are depicted here for the first time. It also boasts a world map that reveals some of South America and the first color printed maps. Columbus’ discovery of the new world by mandate of the Spanish rulers is noted in one map. This edition of Ptolemy’s Geographia (Strasbourg, 1513, first edition) integrates information from Amerigo Vespucci and the recently returned Portuguese explorers.